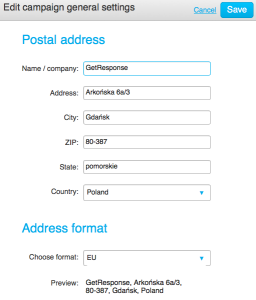 How do I change the postal address associated with a campaign? You can change the postal address attached to your messages in the campaign settings. Select the campaign you want to modify. On the General settings, page move your mouse cursor over the current address. 5. Click Edit to start editing the address. When you’re done with the edits click Save to confirm your changes.